Fantasy Hockey Chutes And Ladders: Playoffs? PLAYOFFS? We have survived much this fantasy hockey season but now comes the first March edition of “Chutes And Ladders”. Riding the fortunes of a fantasy hockey team can be a lot like the original Milton Bradley game. There are enough twists and turns to drive any normal person crazy. So imagine what it is like for the average hockey fan who takes on a fantasy hockey league. Week 22 (23 for some of us). This week brings us the fantasy playoffs in most every head to head league. Whether it is a dynasty or single season league, it all comes down to this four week stretch. If you made your playoffs, congratulations. However if you are in a consolation bracket, there is a way to play it carefully to obtain a higher draft pick in those keeper leagues. Essentially, who is in or out of lineups is pertinent and crucial to success at this level of fantasy hockey. These last few weeks really do separate the contenders from the pretenders. Injuries do really play a big part in fantasy hockey now but hey there were some awfully good fantasy performances last week. The fantasy playoffs are now here and it is time to first reveal our Fantasy Player Of The Week. 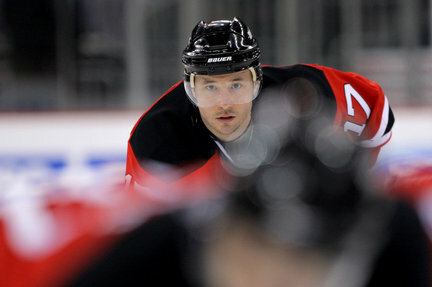 Congratulations to Ilya Kovalchuk of the New Jersey Devils on winning this week’s Fantasy POTW. The New Jersey forward not only scored nine points in the last seven days despite his ice time dropping to only 23:09 per game. Little of that mattered as Kovalchuk tallied five goals and four assists including a hat trick. The big number in all of this is 22. Let us explain. With 22 shots on net last week, Kovalchuk seemed fully back in that shoot first, ask questions later mode that has yielded him the most results. In five of Kovalchuk’s six scoring binges of four or more games, the forward has had five or more shots on goal in a game at least twice in these individual spans. This really is not hard to figure out that when a player simply just rips it instead of just gripping it, the results are clear. Maybe Alex Ovechkin and the Washington Capitals can also. The Devils have to ride Kovalchuk to the playoffs and in the playoffs because honestly when he is on, he is one of the best power forwards out there period for fantasy owners. Fantasy owners have to ride Kovalchuk because of his ice time, his PP ice time per game, and ability to go on these four to six game runs like right now. There was nearly a 30% spike in injuries over the last two weeks ladies and gentlemen. It is a sign that playoff like intense hockey is here. Fantasy hockey teams are feeling the pinch in ways like they did last year. Chances are your team has been impacted in some way or another. At any rate, here are quite a few key injuries for this week with updates. Tuomo Ruutu (Carolina Hurricanes) — Ruutu is back and honestly fantasy owners should expect gradual improvement as he gets up and running after missing almost the last month with injury. While 3/4 of a point a game is not likely, a point every other game is not out of the question. Although the Jiri Tlusty injury could be a boon for Ruutu owners at least this week. Sidney Crosby (Pittsburgh Penguins) — “The Kid” could be back in your fantasy lineup as soon as Thursday against the New York Rangers, which coincidentally is on the NHL Network. The concussion and soft tissue issues have subsided and it is just a question of how much contact he has received via practices in the last week or so. Keep in mind the 24 hour rule exists with Crosby so there will at least be that notice to hustle Crosby in your lineup. Players that produce like Crosby but have an injury like this are the truest risk/reward. Andrei Markov (Montreal Canadiens) — Yes Andrei Markov has returned at last but the problem is not surprisingly, the rust is very much in him. Though he did get a power play assist in game 1, he had two costly turnovers in game number two. No one is really sure what to expect but I am guessing his minutes will gradually rise but the inconsistent play is likely to remain the same. Will he get injured again? That is anyone’s guess at this point. Simon Gagne (Los Angeles Kings) — Gagne is currently on the IR with concussion like symptoms and with his previous concussion history, it may be awhile before he comes back. The problem lies in the fact that Gagne has started skating but as Darryl Sutter proclaimed Gagne is “Further than closer!”. Simply it will be awhile so adjust accordingly. Now the latest we heard was Simon Gagne is skating but there is still no timetable and the drills are very light and compulsory in nature. Nathan Horton (Boston Bruins) — This is just another sad story in what has become unfairly in some ways “the year of the concussion”. Horton has had another fairly substantial setback which means honestly you may not see the power forward until sometime in March at the very earliest. The potential exists that he will not even be ready for the rest of your fantasy season which proves the adage that there is no such thing as a mild concussion. The move for Brian Rolston suggests more than just a problem, it just reeks of regular season ending for Horton sadly. In a simple update, Horton is nowhere near close to returning and is not likely to help your team in their fantasy playoff push. Jimmy Howard (Detroit Red Wings) — This groin injury may not linger very much for Howard which is very good fantasy news for owners out there. As a matter of fact he could play as soon as Tuesday against Los Angeles, though he is still listed as questionable. The morning will tell people if he is ready though this may take a game time decision. Just keep an eye on this one once again. Rich Peverley (Boston Bruins) — Here is another one that hurts Boston as Peverly will miss another 4-6 weeks with a sprained left MCL. There has even been some talk this could linger into April. The latest is that Peverley is progressing nice and could actually be back by late March which is great news for a Boston teams that seems to be taking it on the chin lately. So in the next week, the talent forward could be back in the lineup. Call it a bit of good news in a sea of bad for Boston. Tuukka Rask (Boston Bruins) — Here are a few from the how the injuries can change hours after press time argument. Sometimes there is no way of knowing but Rask is out at least another 3-5 weeks due to that groin strain suffered a little over a week ago. With how Boston has regressed, Rask would have at least been a very good alternative over an extremely rattled Tim Thomas. Yes we said rattled and maybe humbled. That may apply to the entire Boston team at this point. Steve Downie (Colorado) — It was extremely fortunate as Downie turned out to not be seriously injured after all. Legend has it he simply popped his shoulder back in and all seems okay right now as he is playing and playing well. That Landeskog-O’Reilly-Downie trio is a force to be reckoned with. Keep it in mind from now into next season. Pavel Datsyuk (Detroit Red Wings) — There is fortunate news for Datsyuk and he could be back as soon as this week or the weekend after the knee scope done two weeks ago. He seems to be progressing nicely and that is good news for those in head to head playoffs that start very soon. If you own him in weekly leagues, wait till next week just to be safe however. Nick Lidstrom (Detroit Red Wings) — The uncertainty in this bone bruise for Lidstrom is that he is at that age where injuries just take longer to heal. Originally this was a day to day injury that turned into at least a week which looks like maybe two or more. You get the idea. No one seems to really know what really is happening but then again Detroit does not seem that concerned yet. Hopefully the ankle responds well with treatment and that is all that can really be asked at this point. The team and Lidstrom say there is progress but he is likely out Tuesday and Wednesday. Something seems kind of fishy as Lidstrom, even when returning, will likely be “rested”. Taylor Hall (Edmonton Oilers) — Simply Hall is back and no other real explanation is needed. He has played well in the last week and obviously if you do not have him in your lineup, what are you waiting for? Mikko Koivu (Minnesota Wild) — Koivu’s evaluation time is close at hand. Talk seems to center around the fact that Koivu will likely be shut down to get ready for next season. If you have him on your roster, keep him on the IR where he is. Niklas Backstrom (Minnesota Wild) — A leg/groin injury will keep Backstrom out 2-4 weeks and again this may be on the higher side rather than the low so Josh Harding is hurt too but should be available soon supposedly. Given how Harding and Backstrom have been both kind of fragile, Hackett may see several starts this month and in April. Minnesota has not shown much in the way of consistency in front of Hackett but the goalie has played pretty well under grim circumstances. In other notes, Mike Green was suspended three games for this hit as seen here. Also again keep an eye on the injuries to Ryan Callahan and Michael Del Zotto of the New York Rangers. Something just does not add up there. Furthermore, Craig Anderson is getting closer with that lacerated finger but Ben Bishop is making a splash in his place and serving notice for fantasy time. Philadelphia, Columbus, Boston, Minnesota, and Detroit are just a mess injury wise at this moment. Surviving in fantasy leagues is almost as important to winning now than anything else. Thirteen NHL teams have five or more injuries at the current moment. Players are coming and going so it is important to check out Twitter for the absolute latest. These are for the players who have seen their values shoot up for Week 22. Some are waiver wire pickups but most are not. March is when the intensity ratchets up and the fantasy cream is separated from the muck. Let’s get down to business. Jarome Iginla (Calgary Flames) — This man is a “man of fire” fantasy wise right now as he collected five goals and three assists last week. If there is a clutch moment, Iginla just seems to find a way more often than not. Though he is on pace for almost 70 points, that is just not a normal Iginla season. However, if he ends up as a 35-35 player when all is said and done, can anyone really complain as the RW is a traditionally weak fantasy position. Overall, Iginla is on a six game point streak and four game goal streak. With a revived Alex Tanguay and Olli Jokinen, Iginla is looking pretty good right now for his owners. Brad Richards (New York Rangers) — People forget how “off” he was in his first year in Dallas and then rebounded. Yet the slump this year he endured caused many New York fans to get on him and rightfully so. In the last seven days, he shook that off to the tune of seven points, including a three point night on Sunday against the rival New York Islanders. Can Richards continue this pace or will he slide back once again? Fantasy fans clearly need him to keep going but the inconsistency of the Rangers’ offense is very tough to gauge. Injuries could play a role like they always do here. Max Pacioretty (Montreal Canadiens) — The Left Winger had seven points in a week where his best pivot was missing for a bit and he also topped the 30 goal plateau for the first time in his career. Think of how young this player is at 23 years old and Pacioretty is just one year removed from that hit by Zdeno Chara. No one would ever know that this is a player who could be a 40 goal scorer in the NHL for years to come. This is a guy with dangerously good upside and if you got in early, simply you did very well. Sedin Twins (Vancouver Canucks) — The toughest thing about twins is sometimes they just feed negatively off each other as well. Henrik Sedin has gone pointless in eight games with only eight shots on goal. 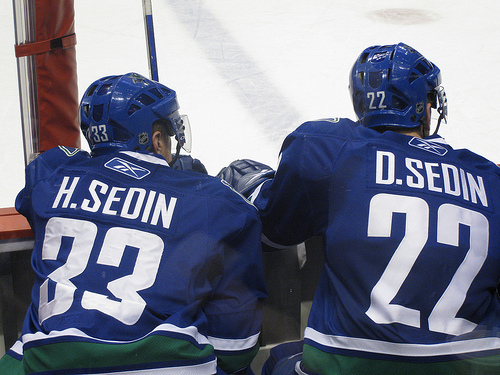 While Daniel Sedin has seen the well gone dry in his last five starts and seven of eight. It is not a surprise that Vancouver has gone 3-3-2 in this stretch that has seen the twins dip below a point a game for the first time all year. One has to think that the fantasy fortunes will turn around and they probably will soon but their downturn in production is more an expectation of the norm than anything else. The Not So “Wild” Team — It was inevitable that the Minnesota Wild would regress to the mean so to speak but they had blown right by it on the express elevator downward. The Mikko Koivu injury combined with the inconsistency of Devin Setoguchi and Dany Heatley have driven fantasy owners batty. Now add in their precarious goaltending situation and even if they get very good goaltending, they are just not very good. Their players are a must no touch at this time and it may be awhile before any could be considered worth a good mention. This has actually slid to a team dishonor this week mostly because of their defense which keeps getting worse as a squad and shows little signs of improvement anytime soon. Tim Thomas and Henrik Lundqvist (Boston Bruins and New York Rangers) — Thomas and Lundqvist have been very bad over the last week and honestly could have been even worse if not for a few fortuitous plays that graced their bottom line. Thomas has been pulled a couple times recently and has a below average .904 save percentage over the second half. Lundqvist has given up three or more goals in his last four starts and just is not seeing the puck well at all. Imagine this duo is your tandem heading onward in your fantasy playoffs and at least this week, there may still be some residual cringing. No one would have ever expected that. Well that wraps it up for this week. Good luck and hopefully it is a solid Week 21 for everyone out there. There is always the unexpected in fantasy hockey and we hope to always spotlight the expected also. Do not forget to follow us @TheProgramBTR for all your fantasy hockey questions and more. Thanks again for reading.